A small farm that holds a big place in the Burlington food scene will soon change hands when Mara and Spencer Welton, founders and owners of Half Pint Farm at the Intervale Center, sell their business to a member of the crew. The Weltons started the three-acre farm, known for tomatoes, microgreens, peppers and other specialty crops, in 2003. They are selling Half Pint to married couple Emily and Sean Mitchell, the Weltons said. Emily, market manager at the Burlington Farmers Market, has worked at Half Pint for three years. Sean is a sous chef at Hen of the Wood in Burlington. 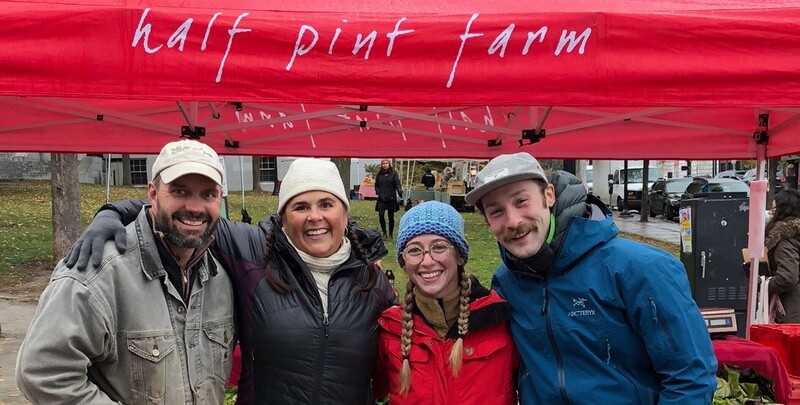 The Half Pint founders, both 43, told Seven Days that several factors figured into their decision to sell the farm, which they operate on land leased from the Intervale Center. "As we've grown as people, I think we feel like we've [done] all the things we set out to try to do with Half Pint," Mara said. Those include growing vegetables that would "inspire people to add more beauty into their cooking," getting people excited about small farms and small vegetables, and "prov[ing] that two people could be profitable on a small acreage," she said. "Three years ago," Mara added, "we looked at each other and said, 'Mission accomplished.'" Half Pint grows about 400 vegetable varieties, a crop list that includes 85 varieties of tomatoes, Spencer said. The farm sells to about 30 restaurants in Chittenden County, including Hen of the Wood, Honey Road, Kitchen Table Bistro and the Great Northern. Healthy Living Market & Café in South Burlington is the only retail market that carries Half Pint produce. At the Burlington Farmers Market, Half Pint's booth is located at the corner of Main and St. Paul streets, making it a kind of unofficial welcome station. "Saturday [at the market] is our social engagement every week," Mara said. "We really value all the amazing people who have supported us all these years and gave this little farm a chance, and believed in us and our products." The Weltons said they aren't certain what they will do next, beyond taking some time off in the coming year. "It was never the full plan to just have a farm," Spencer said. "We've been looking for ways to ease out of that, to test other ideas and see what the obvious next step would be. "It was a tough decision," he continued. "We love our community. We love Burlington. We love vegetables. We had to sort of make that choice to step away — it was going to happen eventually." The original print version of this article was headlined "Crop Rotation"